Just enjoy the ride, man. A lot of the criticism directed at Telltale’s episodic adventures concerns the illusion of choice. That the decisions you make only have a superficial impact on the larger story, and the narrative charges on regardless of your actions. Criticism that, with a few exceptions, is completely justified. It is, in fact, the reason I stopped playing the studio’s games. I felt like I’d figured them out; that I could see the Wizard of Oz yanking the strings through a crack in the velvet curtain. The stories were compelling, but I couldn’t shake the feeling that it was all smoke and mirrors. That I was being hustled. Then Batman came along. I love Batman, and the chance to spend some time with him was enough to convince me to gamble on the first Telltale series, despite swearing them off after burning out on Game of Thrones halfway through. Ten hours later, as the credits rolled, I realised it was the most I’d loved a Telltale game since the first season of The Walking Dead. I wondered why. Batman is no more interactive than The Walking Dead. Its choices are just as meaningless to the overall story, and it obeys the same rigid, slightly tired formula the studio has been dining out on for the past six years. What was different this time, I later realised, was me. I went into Batman knowing full well that I was surplus to the story’s outcome, so I just enjoyed being told it without worrying about being in control. I might not be able to alter the course of the plot, but I can hit a few railway switches along the way. And this is when it struck me that Telltale games are best enjoyed if you think about the journey, not where they’re heading. Altering the tone of the story, and how the protagonist makes their way through it, is really what Telltale games excel at. It’s about how you approach a situation, not how you shape it. 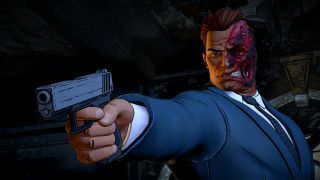 There are opportunities in Batman to craft a personality for Bruce Wayne, through the way he interacts with people and how he chooses to present his alter ego to Gotham. You can use Batman to intimidate and terrorise the city’s criminals—and its citizens. Or you can hold him up as a symbol of hope, reassuring people that someone out there is fighting for them, even if the crooked politicians and corrupt cops are not. The game actually rates your personality at the end, with factors such as compassion, brutality, cunning, and collaboration being recorded as you play, resulting in a final score. It’s pretty gimmicky, but a nice way of showing that your own path through the story will have been, at least in some small, surface level way, different from that of other players. Even though the story will end the same way for everyone, bar a few details here and there, these little choices—and the ripples they send through the narrative—are enough to make the experience feel like more than just passively watching a TV show. Altering the tone of the story, and how the protagonist makes their way through it, is really what Telltale games excel at. It’s about how you approach a situation, not how you shape it. The problem is, Telltale tries to make it seem like its games are much more than that. ‘This story adapts to the choices you make’ it says dramatically at the beginning of an episode, making you feel like you might actually have some agency over what’s about to happen. But you don’t, and I think that’s where a lot of the frustration comes from. Players are primed to expect something that isn’t there, and disappointed when it fails to deliver the goods. One of Telltale’s cleverest tricks, however, is making some moments feel like the most important decision you’ve ever made. If you’ve played its games, you’ll know the feeling. A timer is ticking down, two people are in life or death situations, and you can only save one of them. Even though this will probably only go as far as changing some dialogue—or maybe a character you save will just die later anyway—it temporarily feels like you’ve been handed the controls of the freight train. They’re soon wrestled back, but it’s this illusion that made the first Walking Dead such a hit. Although, admittedly, the power of these scenes has been dampened by their somewhat predictable appearance in successive games—including Batman. There are plenty of games on PC where you’re given the freedom to actually create stories, whether it’s an immersive sim, a sandbox, or an RPG. So I don’t think it’s a problem that Telltale adventures, which sit comfortably at the casual end of the spectrum, exist as lighter, more accessible alternatives. They’re a way to experience an interactive story without as much effort or investment. So I’ve decided to give Telltale’s back catalogue another chance and play them with the mindset that, yes, the choices I’m making here don’t mean much, but I can still enjoy taking a few interesting backroads and sidestreets along the way as I hurtle towards the inevitable conclusion. I would like to see the studio make games where your decisions have a direct, explicit impact on the story, but until then, a shift in attitude will have to suffice.